For the French cider brandy, see Calvados. Calvados (French pronunciation: ​[kal.va.dos]; English /ˈkælvədoʊs/) is a department in the Normandy region in northwestern France. It takes its name from a cluster of rocks off the English Channel coast. Calvados belongs to the region of Normandy and is surrounded by the departments of Seine-Maritime, Eure, Orne and Manche. To the north is the Baie de la Seine, part of the English Channel. On the east, the Seine River forms the boundary with Seine-Maritime. Calvados includes the Bessin area, the Pays d'Auge and the area known as the "Suisse normande" ("Norman Switzerland"). The most notable places in Calvados include Deauville and the formerly elegant 19th-century casino resorts of the coast. Agriculture dominates the economy of Calvados. The area is known for producing butter, cheese, cider and Calvados, the apple-based spirit that takes its name from the area. 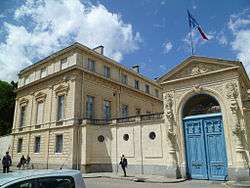 The President of the General Council is the centrist Jean-Léonce Dupont, the former dominant figure of the right and centre in the department. The Conseil General of Calvados and Devon County Council signed a Twinning Charter in 1971 to develop links with the English county of Devon. The inhabitants of Calvados are called "Calvadosiens" (male) and "Calvadosiennes" (female). In 1999, Calvados had 648,299 inhabitants, making it the 30th most populated French department. 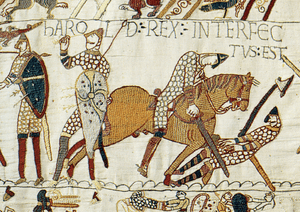 The Bayeux Tapestry is on display in Bayeux and makes the city one of the most-visited tourist destinations in Normandy. Juno Beach Centre at Courseulles-sur-Mer, Calvados, commemorates the D-Day landing of the Canadian liberation forces at Juno Beach during World War II in 1944. The cult of Saint Thérèse de Lisieux brings large numbers of people on pilgrimage to Lisieux, where she lived in a Carmelite convent. Every September, Deauville hosts the Festival of the American Movie and the beach resort of Cabourg hosts the Festival of the Romantic Movie. Annually, the city of Caen celebrates the festival of the electronical cultures called "Nordik Impakt" & The festival of Beauregard, just around Caen. The local dialect of the Norman language is known as Augeron. It is spoken by a minority of the population. Calvados, via the port of Ouistreham, is an entrance to the continent from Britain. There are two airports: Caen-Carpiquet and Deauville-Saint Gatien. The department of Calvados has several popular tourist areas: the Bessin, the Plain of Caen, the Bocage Virois, the Côte de Nacre, the Côte Fleurie and the Pays d'Auge. Several beaches of Calvados are popular for water sports, including Cabourg and Merville-Franceville-Plage. This ranking takes into account all the municipalities having over 10% of second homes in the departement of Calvados. 80% of owners are from the Paris area, 10% are English and 10% are local. According to the general census of the population of 1 January 2006, 18.9% of housing available in the department were second homes. Source INSEE, chiffres au 1 January 2006. Aquatic sports are often played on the coasts and beaches, for example, kite surfing and beach volleyball. Stade Malherbe Caen is a professional football team from Caen, who currently play in Ligue 1. ↑ Chisholm, Hugh, ed. (1911). "Calvados". Encyclopædia Britannica (11th ed.). Cambridge University Press. ↑ Lepelley, René (1990). Calvados, qui es-tu, d'où viens-tu ou le nom énigmatique d'un département Français : Critique d'une tradition, hypothèses diverses, proposition d'interprétation. C. Corlet. ↑ "Twinning". Devon County Council. Retrieved 8 December 2009. Wikimedia Commons has media related to Calvados.